There are those moments when you are travelling, and you come across the unexpected. Moments that take hold of you and stay with you long after you experience them. Such was the case when my husband and I visited the Pilgrimage Church of the Scourged Saviour, Wies — also known as the Church in the Meadow, in Bavaria, Germany. 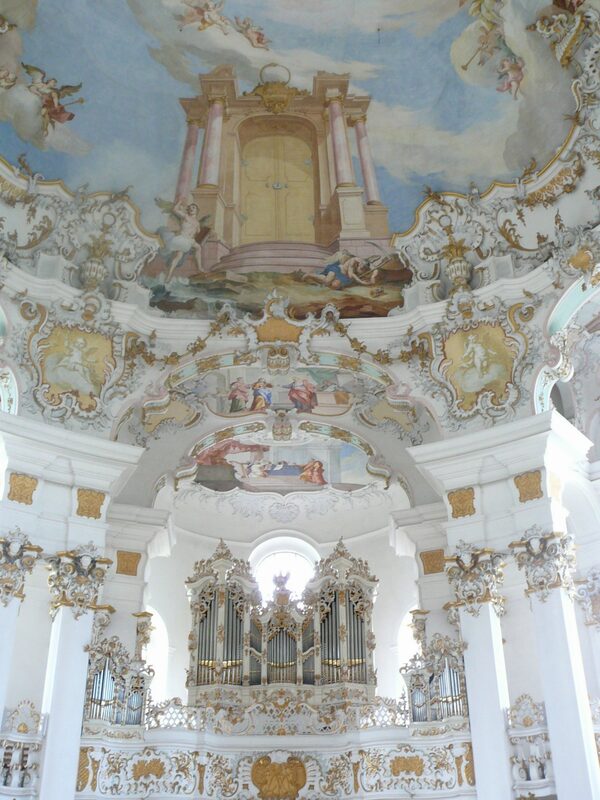 Our friends from Munich told us this church was well worth the stop on our way to Füssen and the Neuschwanstein Castle. The church is in a rural area surrounded by lush green fields, and on the day we visited, there was misty rain and fog hanging heavy in the air. Even though it was spring, it was a chilly morning by our Australian standards, and we were rugged up in winter coats, gloves and scarves. From a distance, the church looked unremarkable compared to some of the grander cathedrals we have visited. As we drew closer, it had a pretty appearance with rendered pale yellow walls, an elegant spire, and a weathered, wooden front door. I wondered what we would discover inside. The interior that greeted us was nothing short of exquisite. 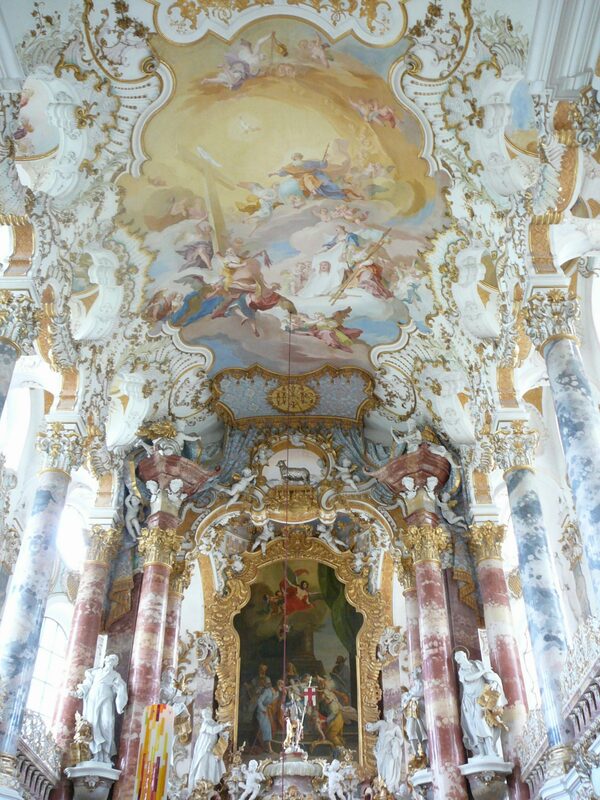 The church is crafted in the Bavarian rococo style with ornate cornices and stucco, ceiling frescoes and carvings. I am always astounded how churches such as this have endured throughout human history; through political unrest, wars, inclement weather and the ravages of time. According to the church website1, the church was at risk of demolition between 1803–04, but through the petitions and personal contributions of local farmers, the church was saved. What a loss it would have been had it been demolished. The church has since enjoyed a major restoration between 1985 and 1991, with the intent to restore it as closely as possible to its 18th Century glory. 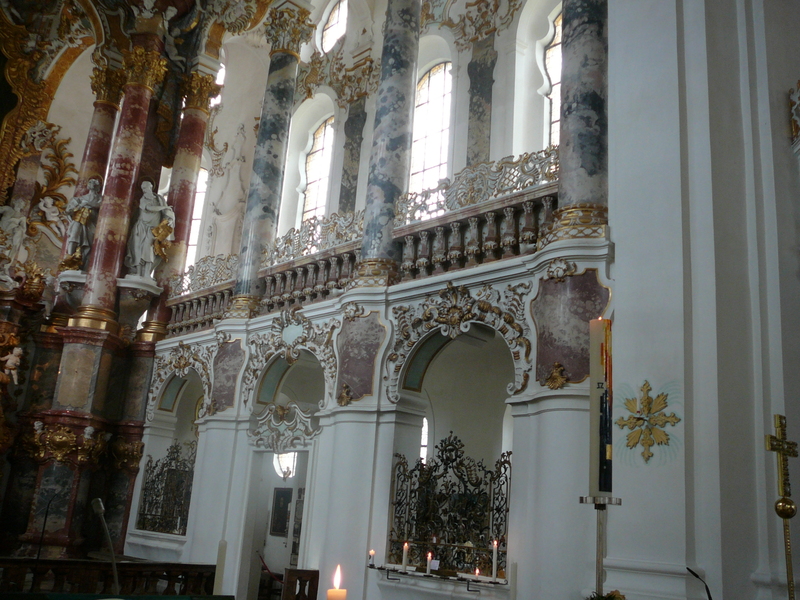 The church re-opened on 5 May, 1991, with the restoration costing 10.6 million Deutsche Marks.1 Whilst this church does not have the grandeur of some of the great cathedrals of Rome or Paris, its beauty and ornateness is something special and well worth the visit. We took numerous photos of the interior before moving to the aisle to the left of the main chapel. Pilgrims from all over the world have left photos and prayer cards on the walls invoking prayers for healing for themselves, or loved ones who were ill, missing or experiencing difficulties. Some offered thanks for their prayers being answered. There was one prayer card I have been unable to forget. Even now, a year later, it has stayed with me. The card contained a photograph of a boy in his early teens missing since the 1970s and thought to be in Siberia. I wondered what a boy his age would have been doing in Siberia, so far from his homeland. Had he been kidnapped, or run away from home? What circumstances had conspired to see him separated from the rest of his family? Around forty years have passed since the boy’s disappearance and the prayer card remains on the wall. I wondered if his parents were still alive, and if they ever found him. Or had they lived out their remaining years yearning for their lost son, constantly wondering where he might be, and what had become of him? All the family memories and milestones they had lost that can never be reclaimed. A part of me is hopeful. Maybe they did find their son, and there was a joyful reunion. But given others had posted their thanks for their prayers being answered, the fact that this card remained dimmed my hopes. It was a sobering thought. A reminder to be thankful for all the good things in my life: family, friends, and the freedoms we enjoy in a democratic country that is not beleaguered by civil war, political unrest and famine. When you visit the church, take a moment to sit, reflect and absorb the wonders of this beautiful place. 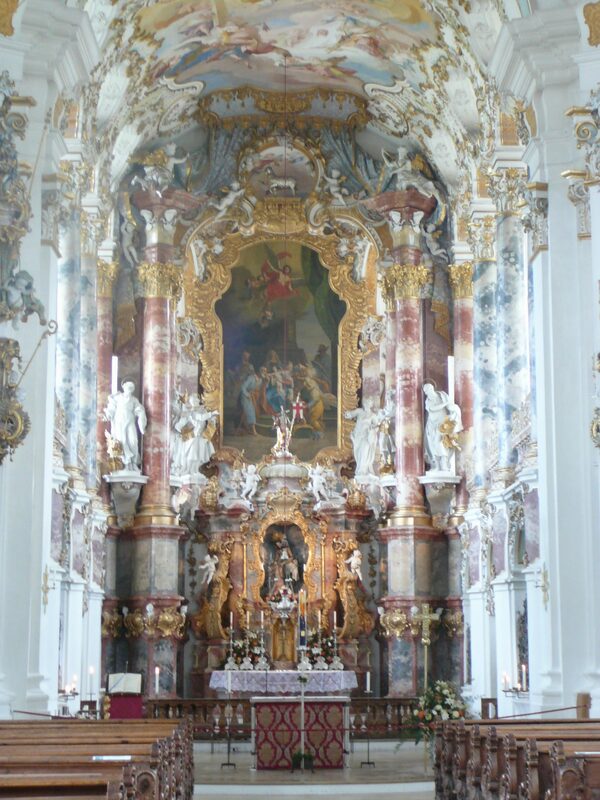 The Pilgrimage Church of the Scourged Saviour is located between Steingaden and Wildsteig in the Pfaffenwinkel (land of monasteries) region of Bavaria, Germany. Enter your email address to subscribe to my blog Write at this Moment and receive notifications of new posts by email. All content and images on this site are copyright to Susan Braghieri unless attributed otherwise.